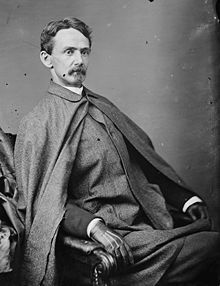 John James Ingalls (December 29, 1833 – August 16, 1900) was an American politician. Every man is the center of a circle, whose fatal circumference he can not pass. Eulogy on Benjamin Hill, United States Senate, Jan. 23, 1882. Translated: "to the stars through difficulties". State motto of Kansas, reported to have been devised by Ingalls.